The story of Lieut. 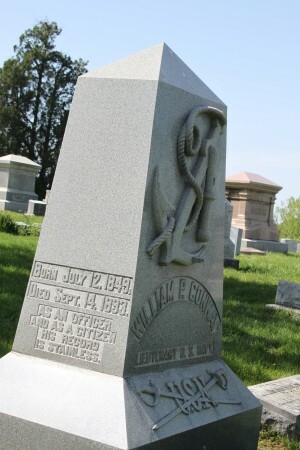 William P. Conway was heard at Voices of Elmwood in 2009 and will be retold at this year’s Echoes of Elmwood, along with nine other stories. Lieut. Conway’s story is one of heroism and survival. But with all great stories, we need to start at the beginning. William P. Conway was born in Owensboro on July 12, 1849 and was the son of Dr. James Conway. On October 1, 1866, he entered the Naval Academy at Annapolis, graduated four years later, and immediately went to sea. During his cruises of twenty years he visited nearly every country on the globe and acquired a vast fund of information concerning the various people of the world. On November 1, 1888 he married Susie Woodson, and they had one son. He engaged in many thrilling expeditions, but the great event of his life was his conduct in the wreck of the U.S.S. Huron. On November 23, 1877, the Huron was put out to sea with a ship’s company of about one-hundred and thirty-four souls. Everything was buoyant, happy and the entire crew from captain to cabin boy was delighted with the prospect of a speedy run to Havana and a please cruise among the West India Islands. Scarcely ten hours had elapsed before nearly all of the joyous company had passed from life to eternity, and the driving blasts of the great deep had sighed their eternal requiem. The cause of the disaster to the Huron was evidently owing to the fact the effort of the navigator of the Huron to hug the shore and keep out of the Gulf stream. The Huron had run aground off Nags Head, North Carolina, in heavy weather, shortly after 1 a.m. The crew worked steadily to free the ship, but the ship soon healed over, carrying 98 officers and men to their deaths. To hear the complete story of this harrowing saga, plus nine other amazing stories, please come to Echoes of Elmwood at Elmwood Cemetery May 30 & 31, 2014 at 7 & 9 p.m. Tickets are being sold at the Owensboro Museum of Science and History . Please call 270-687-2732 for more information.